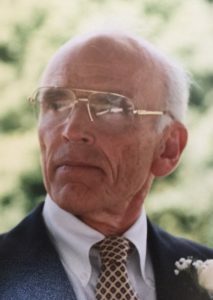 Anthony V. Lynch, III, age 94, passed away peacefully on June 8, 2018 in Winston-Salem, NC. Known as Tony by friends and family, he was predeceased by his beloved wife Jane (Wischmeyer) Lynch and his parents, Anthony V. Lynch, Jr. and Gertrude (Momand) Lynch of Greenwich, CT. He leaves behind a sister, Keiron Lynch Jesup of Dorset, VT; two sons, Anthony V. Lynch, IV of Lyme, CT and Keiron G. Lynch, II of Melvin Village, NH; three step-daughters, Emily A. Arents of Arcata, CA, Dorothy (Arents) Caudill of Winston-Salem, NC, and Gina Arents of Nottingham, MD. Tony had seven grandchildren, eight great-grandchildren, and five great-great grandchildren. Tony was born and raised in Greenwich, CT. He attended Greenwich Country Day School and Phillips Academy Andover, where he was a friend and classmate of future President George H.W. Bush. Tony then went on to Princeton University. His time at Princeton (Class of 1945) was interrupted by World War II. At age 18 he volunteered to serve as a U.S. Navy pilot, flying combat missions in Grumman TBF Avenger torpedo bomber fighters and the like from aircraft carriers in the Pacific. Tony returned from the war and, in 1947, finished his college education at Princeton and began his career as a stockbroker on Wall Street. He married the love of his life, Jane, in 1953 and raised his family in Mt. Kisco, NY, and then Southport and Greenwich, CT. He and Jane retired in 1982 to Shushan, NY and in 1991 moved to warmer climes in Clemmons, NC. Tony was known for his warm and welcoming smile, his dry wit and keen intellect right up to the end of his life. He had a real passion for the outdoors as a hiker, sailor, RV’er, and gardener. He loved people, wanting to hear their stories before telling his own. He was a Boy Scout leader with his sons and, later in life, volunteered at several state parks in the far west doing whatever was needed – from docent work to grounds keeping. He was dedicated to his family and had a strong moral compass which he did his level best to pass on to those he loved. We are especially grateful to the compassionate staff at Arbor Acres Assisted Living in Winston-Salem for the care and friendship they provided in the final years of his life. A memorial service celebrating Tony’s life will be held for family and friends at St. Ann’s Episcopal Church, Old Lyme, CT on August 11th at 11:00 AM. His ashes will be interred next to his beloved Jane’s in St. Ann’s Memorial Garden. In lieu of flowers, donations may be made to the Nature Conservancy, Habitat for Humanity, or to the charity of your choice.